I whinnied in fear, as the snake-like things held my hoofs tighter. My ankles burned, like as if I was bitten, or something. I struggled to get up, but the snake things held me down. 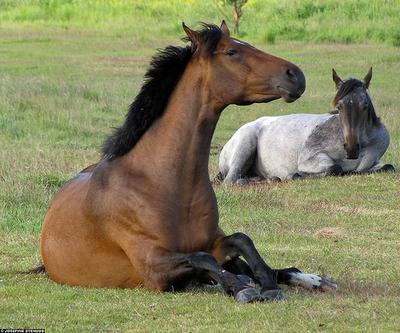 I heard a whinny, it wasn't me, it was from another horse. I lifted my head up and tried to find the source of the whinny, but it was pitch black, so I couldn't see a thing. Suddenly, I felt faint. I felt like I was about to pass out. My eyes slowly closed, and everything went black. Everything was pitch black. There was an eerie silence. I felt like I was floating. In the air. I felt a sudden wave of comfort. Had I died? Am I in heaven? I floated in that unknown place I called "heaven" for what felt like hours. I felt very comfortable, I wanted it to last forever. But unfortunately, it didn't. I was woken up with quick flash of pain. I was bearable. It just felt like something nipped me. I opened my eyes. A beautiful dark horse stood looking down at me, and I could tell they were worried. I lifted up my head, staring up at them. We were staring at each other for what seemed like hours, until the horse shook their head and walked away. I down at my legs. They weren't tied anymore. I gathered my legs up under me, and struggled to get up. All of my legs were sore. If I put even just a little bit of pressure on them, they hurt. But anyway, I still managed to stand up. I looked around, legs shaking like a newborn foal. I saw bars. Metal bars. Red bars. Everywhere. I saw humans. Wild-eyed humans. With those horrifying snake-like things. The same ones that tied me up. I reared up in rear when one of the humans looked at me . I snorted and turned away. I turned my head looking back at the human. He was laughing, pointing at me. I trotted away, wanting to never see a human again. That is an awesome story! I hope you write more!